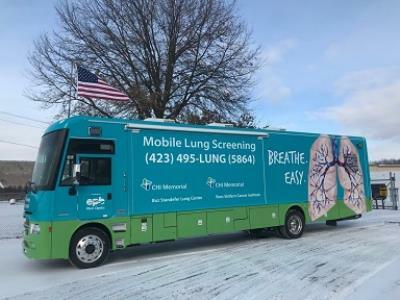 CHI Memorial’s mobile lung CT coach will provide computerized tomography screenings at CHI Memorial Hospital Georgia, 100 Gross Crescent Circle in Ft Oglethorpe, on Monday, Nov. 12 from 4-7 p.m.
"Lung cancer screening is a test to look for signs of lung cancer in otherwise healthy people. The low-dose CT scan shows a 3-D image of your lungs that is clearer and more detailed than regular x-rays, allowing doctors to diagnose lung cancer at its earliest stage, before there are any symptoms," officials said. "This is when lung cancer is most curable. The whole process takes less than ten minutes and there is no need to do anything special to prepare for the screening." The low-dose CT lung cancer scan has been shown to improve survival by 20 percent according to The National Lung Screening Trial by the National Cancer Institute. Private insurance companies cover lung cancer screening for high-risk individuals. Medicare and Medicaid also cover lung cancer screening. Grant funds are available for eligible uninsured and under-insured people to have the low-dose lung CT screening. If you feel you are at risk, 423-495-LUNG (5864) to discuss if a lung screening is right for you, or to schedule an appointment.